AMD Vega 20 GPU has been spotted in Linux driver code. It is expected that Vega 20 will be a die shrink of the original Vega GPU. According to the previously leaked roadmaps, AMD Vega 20 will appear in the Q3 or Q4 of this year. The recent Linux patch includes the AMD Vega 20, which also points toward the arrival of new Radeon RX 600 series graphics cards, as per Segment Next. AMD Vega 20 IDs are one less as compared to the previous AMD Vega 10 IDs. This could mean so many things but we should wait for more info before jumping in the speculations mill. The missing ID could be an AMD Vega gaming GPU, which will be based on the 7nm process. It could be an internal project to see how well it performs and what kind of benefits it has to offer as compared to AMD Vega 10 graphics cards since it is not mentioned here. The spotted Linux driver code, which came contains references to six new AMD Vega 20 GPUs. 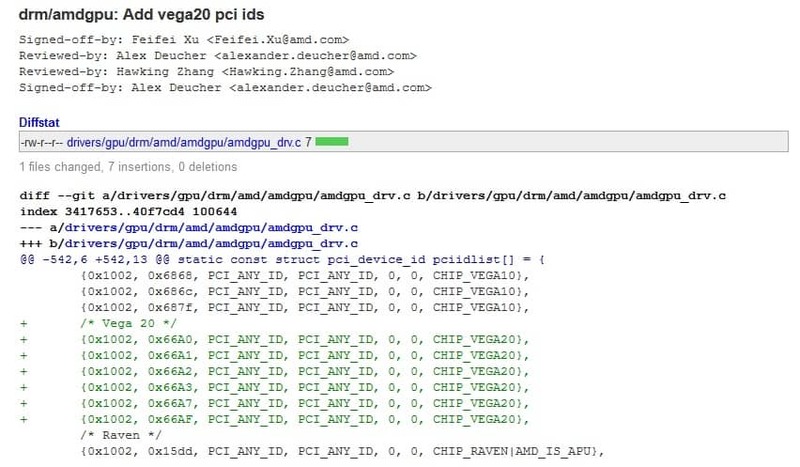 In the screenshot above, you can spot the device IDs listed under the /* Vega 20 */ section where you can see that the code has been reviewed and signed by three engineers from the AMD. It should be noted that AMD Vega 10 patches were released 3 months before AMD Frontier Edition released. However, this guess is not as solid as the official confirmation, but it is highly probable that AMD Vega 20 based graphics cards could be coming out 3 months from now, as per the Hexus. So, what you think about AMD Vega 20? Share your thoughts with us by writing in the comment section below.